Music localization for cultural preservation Music localization for cultural preservation | Information will be free! Most available music software assumes that the user operates within the realm of “standard” Western music parameters (tuning, scales, nomenclature, instruments, etc.) Regardless of its historical reasons, this state of affairs constitutes an impediment to the exploration, preservation and dissemination of music cultures that function outside of these parameters. A similar condition affecting literary and textual cultures of the world was addressed by the creation of standardizing bodies such as the Unicode Consortium, with results that have encouraged the spread of non-Latin alphabets and languages across the Internet. We explore the concept of “music localization” (or internationalization) as a framework for thinking along similar lines in the realm of music software. In this framework, localization involves retrofitting existing software with the ability to support non-Western music systems, whether in the notation, playback, production, or pedagogical domains. Of course, much work has been done by ethnomusicologists to inventory and analyze musical systems of the world, and we can build upon these valuable analyses to design software abstractions that will allow these music systems to be expressed digitally. For this talk, I present a concrete example based on my personal background. 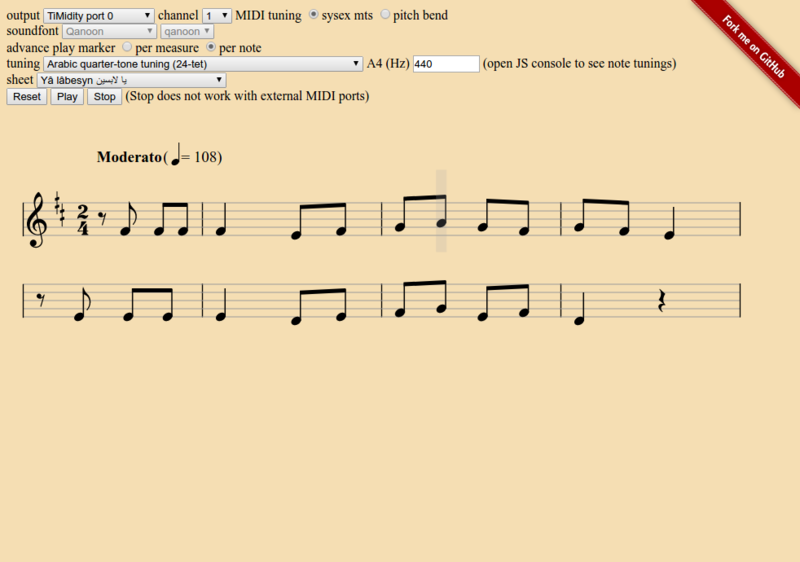 I show how open source tools were used (and patched) to present songs of the Egyptian and Arabic tradition, packaged as a Web application using modern standards such as Web Audio and Web MIDI. Some of the source material was obtained by studying and adapting historical documents dating from the French expedition to Egypt (1798-1801) - authored by a musicologist (Guillaume André Villoteau, 1759-1839) who accompanied Napoléon’s campaign and describes the state of music in Egypt at the time. Because Egyptian folk music was mainly passed on as an oral tradition, this document provides a valuable insight into the evolution of Arabic music practice in that particular place and time.